Washington - The Trump administration’s new policy allowing state work requirements for Medicaid recipients is legally questionable, more than two dozen Democratic senators said Thursday, framing an argument likely to be aired in court. The senators’ letter to acting health secretary Eric Hargan reads like a memo to legal groups preparing a court challenge on behalf of low-income Medicaid beneficiaries. Last week, the administration unveiled its policy letting states impose Medicaid work requirements, and promptly approved a waiver request by Kentucky to carry out its version. 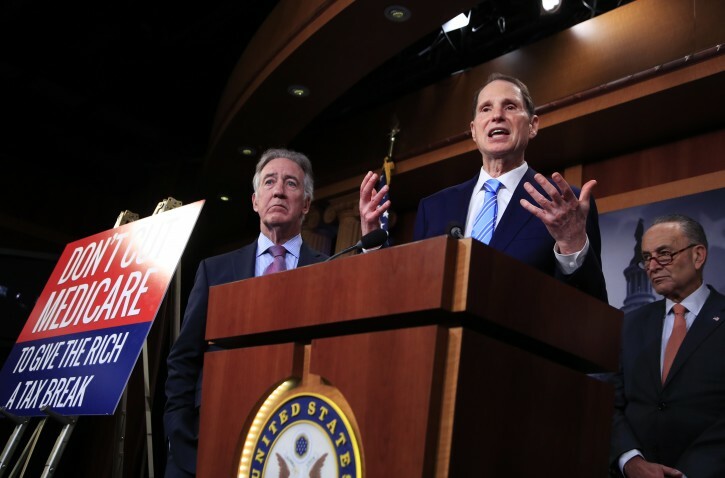 When President Barack Obama was in office, congressional Republicans backed litigation to tie up parts of the Affordable Care Act, and now Democrats seem to be following a similar playbook with President Donald Trump’s health care agenda. The letter, drafted by Sen. Ron Wyden, D-Ore., said work requirements “contradict the plain text and purpose” of the Medicaid statute, as well as “Congress’s longstanding intent for the Medicaid program.” It was signed by 29 senators ranging from liberals like Vermont independent Bernie Sanders and Elizabeth Warren of Massachusetts to moderates like Pennsylvania’s Robert Casey and Tom Carper of Delaware. Although the Medicaid law allows waivers for states to experiment with different ways of providing services, a work requirement could defeat the central purpose of the statute, since people could lose their health care for failing to fulfill the obligation, they argue. “Harmful ideological policies such as work requirements, mandatory drug testing, time limits, onerous cost-sharing and the like undercut and exceed the statutory authority provided” for the Department of Health and Human Services to grant Medicaid waivers, the letter said. Such proposals “clearly undermine the purpose of the Medicaid Act, prioritizing ideology over health,” the letter concluded, asking the Trump administration to reconsider its policy. Medicaid is a federal-state collaboration covering more than 70 million low-income people, making it the largest government health insurance program. Beneficiaries range from many newborns to elderly nursing home residents. Under Obama, the program was expanded with an option for states to extend coverage to low-income adults, many of whom are already working in jobs that don’t provide health insurance. There was no immediate response from the Trump administration. In laying out the new policy, Medicare and Medicaid administrator Seema Verma said studies show that work is associated with better health, so that encouraging work is a legitimate goal for the program. Critics question those studies, arguing that they show healthy people tend to be working, not that work makes people healthy. The National Health Law Program, a nonprofit providing legal services to low-income people, is considering a lawsuit to block work requirements from taking effect. Earlier this week, Kentucky’s GOP Gov. Matt Bevin said he will end Medicaid benefits for more than 400,000 people covered by the state’s program expansion if the courts overturn the new work requirements. That’s possible because the Medicaid expansion is optional for states. Why would anyone be against work requirements? This just makes no sense. That being said people get the ills of government programs wrong The biggest problem right now is that it encourages people to work and stay at easy low income jobs. The idea is if I can get an easy part time or maybe even full time job (but never more than 8 hours a day) and get 60k from govt progarms why become an accountant. The system is already set up that many tax credits and programs only arrive when you work. But why work hard? If I can be a shlock at some business down the block, earn say 40K and never work over time or get burdened with student debt plus I get 60K from the govt, why would I want to be an accountant, have to shlep to the city daily , load on student debt etc.. and bring home 50K after taxes (That's before additional health care costs like dental copays, deductibles). Before anyone gets excited and exclaims oh all you Lakewooder's who voted for Trump will now loose. 1) Students are considered workers as far as govt programs are concerned. I am surely not happy and wish the system would be different. But sorry no lose to Lakewood. "drug testing undermines" .... Morons!!! Drug testing is an unnecessary expense. Then you're a liberal, always telling people what to do.